I wonder if sometimes the fish don’t tickle the horses’ noses while they drink. We have goldfish in our water tank. Five of them. Originally, we added the goldfish when we had the large, 200 gallon tank, because they do a tremendous job of eating mosquito larvae. Right now we have only the 70 gallon tank, but we’ve become attached to them. The goldfish are pretty hardy. They generally winter well and live for a year or more (we heat the tank in the winter). 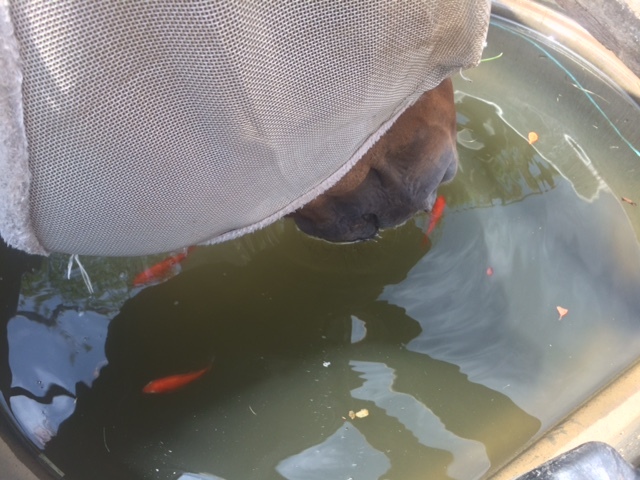 The funny thing is that they swim right up to the horses’ mouths when they drink. They must enjoy the small amounts of food that are dropped in on the horses’ whiskers. Certainly, they don’t bother the horses one bit! We have spring fed waterers where I board and somehow a school of bluegill has come to live in one. Doesn’t bother the horses at all and-like you said-it keeps insect larvae down.